Far from being the deadly venomous spider of urban legend who only fails to kill people because of his small fangs, daddy long legs isn't a spider at all, doesn't bite people and has no venom. Daddy long legs is related to spiders, and like them, he's an arachnid. There are many species of daddy long legs, all members of the order Opiliones. Keeping a daddy long legs as a pet is educational. You can supply his habitat and food with things you have at home. Any of his eight legs can detach when the daddy long legs is stressed, but it will grow back. In some species of daddy long legs, the fallen leg continues to twitch for up to an hour. This might be a survival adaptation to divert a predator's attention while the daddy long legs escapes. His scent glands are another defense. When threatened, he'll release a stink to repel anyone who might want to eat him. Unlike spiders, he has only two eyes, not six to eight. They differ from spiders in having a body that looks like one long oval of abdomen. Spiders have two segments that make them look like they have a waist. Spiders have silk glands for spinning webs and may have venom glands. Daddy long legs don't have silk glands or venom glands. If you see something with very long legs making a web, it might be a cellar spider, a real spider who is often confused with daddy long legs because of its long legs. 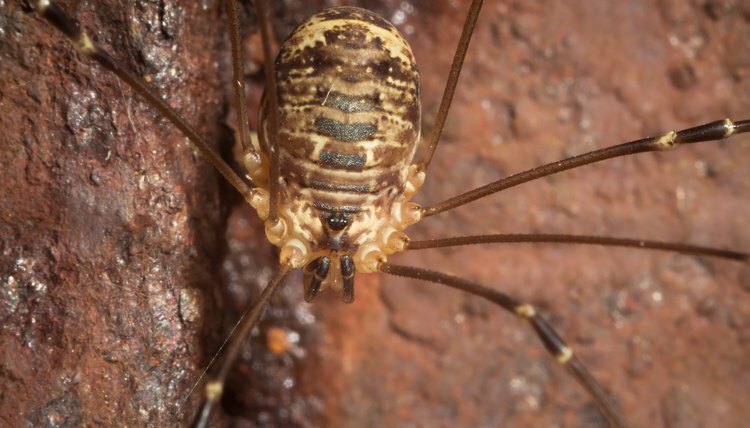 Your long-legged pets also called phalangids and harvestmen because they're active in late summer and autumn. The daddy long legs is most active at night; in nature, he often doesn't come out of hiding until twilight. He crawls into cracks, holes, rotted wood, leaf debris and other sheltering places where he can be undisturbed during the day. When he hunts for food, he can kill like a live glue trap. Researchers from Kiev studied and filmed how daddy long legs capture prey and found the glue they exude allows them to secure small prey who could otherwise escape, according to Wired. Keep your daddy long legs in an aquarium or box that's at least 12 inches long and put a screen over the top so he'll have air. Add up to an inch of sand or dirt and give him some leaves or small plants so he can hide. A terrarium makes a good home because your pet will eat fungus and decaying plant matter. Keep his home away from direct sunlight so it doesn't become too hot. Cotton balls or blotters dipped in water will provide him with moisture; replace them every two to three days so they don't get moldy. Your daddy long legs can't live without water, but the surface tension of water in a dish or puddle can be a problem for him, so using a moistened blotter or cotton works well. He eats meat in the form of all kinds of bugs and also eats vegetation and plant juices. Feed him bits of fatty meat, butter, bread crumbs and insects. He'll eat insects dead or alive including ants, worms, aphids and beetles. Releasing your daddy long legs into the garden after your project will allow him to continue controlling pest insects who harm plants.